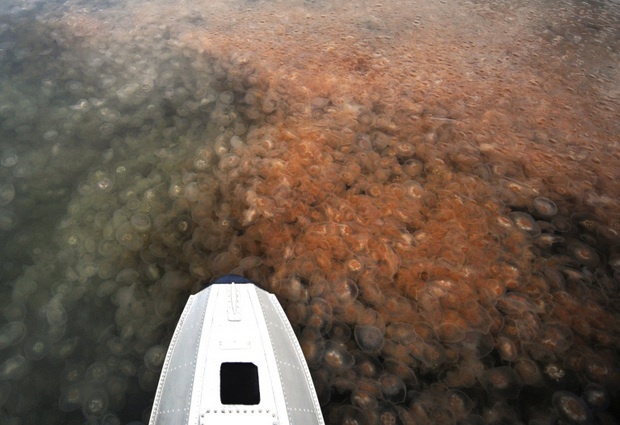 Jellyfish surround a floatplane pontoon. Photo courtesy of Washington Department of Ecology. Coastal ecosystems face a variety of natural and anthropogenic influences, raising questions about mechanisms by which species abundance and composition change over time. We examined these questions by synthesizing 6 surface-trawling efforts in greater Puget Sound, Washington (USA), spanning 40 yr, and then determining changes in forage fish abundance and composition and jellyfish prevalence. We also assessed whether patterns were associated with potential anthropogenic pressures (human population density and commercial harvest) as well as large-scale climate signals. We found evidence for trends in abundance of all forage species in 4 sub-basins of Puget Sound. Cumulative distribution functions of catch per unit effort indicate that the historically dominant forage fishes (Pacific herring and surf smelt) have declined in surface waters in 2 sub-basins (Central and South Puget Sound) by up to 2 orders of magnitude. However, 2 other species (Pacific sand lance and three-spine stickleback) increased in all 4 sub-basins. Consequently, species composition diverged among sub-basins over the last 40 yr. In addition, jelly - fish-dominated catches increased 3- to 9-fold in Central and South Puget Sound, and abundance positively tracked human population density across all basins. The strongest predictors of forage fish declines were human population density and commercial harvest. Climate signals offered additional explanatory power for forage fish but not jellyfish catch. These patterns suggest possible linkages between coastal anthropogenic activities (e.g. development, pollution) and the abundance of forage fish and jellyfish in pelagic waters. Our findings also provide a basis for improving indicators for assessment, monitoring, and spatial planning to rehabilitate pelagic ecosystems. Greene, C., Kuehne, L., Rice, C., Fresh, K., & Penttila, D. (2015). Forty years of change in forage fish and jellyfish abundance across greater Puget Sound, Washington (USA): anthropogenic and climate associations. Marine Ecology Progress Series. 525, 153-170.